Also serving communities of Vienna, Sistersville. There are 12 Assisted Living Facilities in the Parkersburg area, with 3 in Parkersburg and 9 nearby. The average cost of assisted living in Parkersburg is $2,195 per month. This is lower than the national median of $3,346. To help you with your search, browse the 32 reviews below for assisted living facilities in Parkersburg. On average, consumers rate assisted living in Parkersburg 3.5 out of 5 stars. Better rated regions include Marietta with an average rating of 4.5 out of 5 stars. Caring.com has helped thousands of families find high-quality senior care. To speak with one of our Family Advisors about assisted living options and costs in Parkersburg, call (855) 863-8283. Located in Wood County, West Virginia, Parkersburg is a city situated along the Ohio and Little Kanawha Rivers, which provides a picturesque hiking area for seniors who enjoy nature. The Blennerhassett Island State Park hosts a variety of programs throughout the year for seniors, including a grandparent’s day buffet in September. For discount meals, Shoney’s and Golden Corral are favorites for retirees. Retirees can find two assisted living facilities within the city of Parkersburg and nine nearby. These facilities are regulated by the state’s Department of Health and Human Resources (DHHR). There are two types of residential care facilities within the state, including assisted living residences (ALRs) and residential care communities. The main difference between the two is individuals in residential care communities must be able to care for themselves in the event of an emergency. The Parkersburg area is home to world-class medical facilities, including the Camden Clark Medical Center, in the event of medical emergencies or illness. Parkersburg has an array of community resources for seniors, including the Wood County Senior Citizens Association, an organization that provides nutrition and information services as well as at least two senior centers. The Wood County Senior Citizens Association provides transportation for seniors who need rides to and from medical appointments, to the grocery store, bank and for general daily needs. Seniors living on a budget may find it easier in Parkersburg due to the low cost of living within the city. Based on the U.S. average of 100, the cost of living in Parkersburg is 80.2. This is also lower than the state’s average of 83. Based on a scale from one (low) to 100 (high), the violent crime rate is 30.4, which is lower than the national average of 31.1. The property crime rate is 56.7 in Parkersburg, while the national rate is 38.1. This may be of a concern for seniors who like to venture out alone. Parkersburg is the perfect city for seniors who prefer milder summers. The average high in July is around 86 degrees, which provides comfortable temperatures for sight-seeing and outdoor activities. January lows are around 22 degrees. Assisted Living costs in Parkersburg start around $2,195 per month on average, while the nationwide average cost of assisted living is $4,000 per month, according to the latest figures from Genworth’s Cost of Care Survey. It’s important to note that assisted living rates in Parkersburg and the surrounding suburbs can vary widely based on factors such as location, the level of care needed, apartment size and the types of amenities offered at each community. 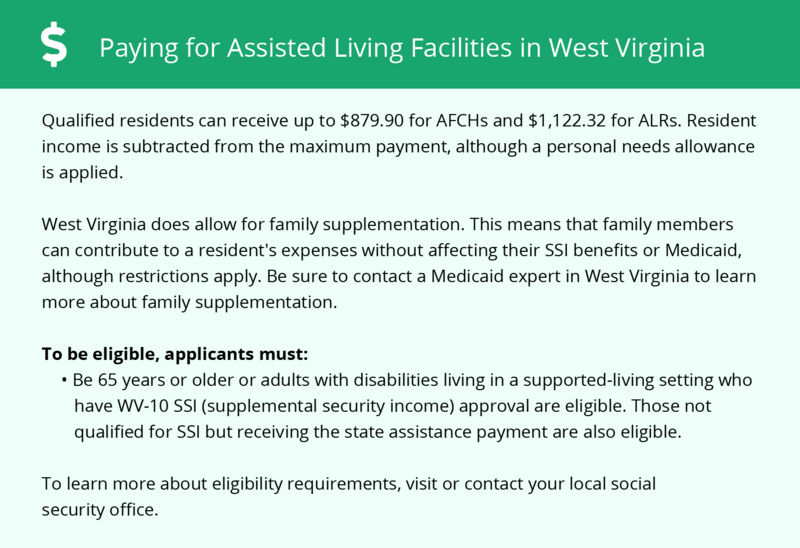 In the state of West Virginia, financial assistance for assisted living facilities is available through the state’s Medicaid program’s special needs circumstance. 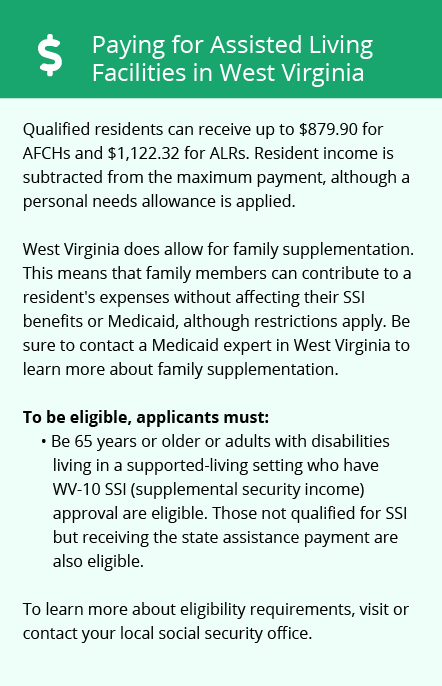 This assistance is approved for seniors on Supplement Security Income (SSI). The amount available is based on the resident’s income minus a personal needs allowance. Parkersburg West and the surrounding area are home to numerous government agencies and non-profit organizations offering help for seniors searching for or currently residing in an assisted living community. These organizations can also provide assistance in a number of other eldercare services such as geriatric care management, elder law advice, estate planning, finding home care and health and wellness programs. To see a list of free assisted living resources in Parkersburg West, please visit our Assisted Living in West Virginia page. Parkersburg West-area assisted living communities must adhere to the comprehensive set of state laws and regulations that all assisted living communities in West Virginia are required to follow. Visit our Assisted Living in West Virginia page for more information about these laws.